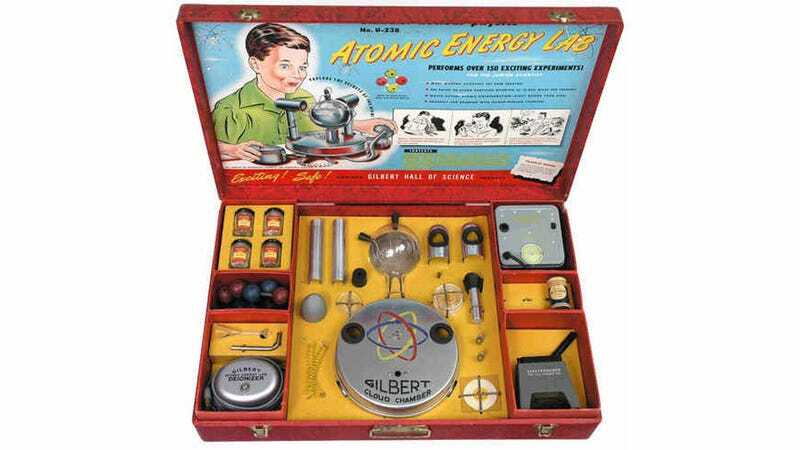 The Atomic Energy Lab set was only available from 1951 to 1952 and sold for a whopping $50 (that's without inflation). The set came with four types of uranium ore, a beta-alpha source (Pb-210), a pure beta source (Ru-106), a gamma source (Zn-65? ), a spinthariscope, a cloud chamber with its own short-lived alpha source (Po-210), an electroscope, a geiger counter, a manual, a comic book (Dagwood Splits the Atom) and a government manual "Prospecting for Uranium."